The Giant Cowbird, Molothrus oryzivorus, is a large passerine bird in the New World family Icteridae. It breeds from southern Mexico south to northern Argentina, and on Trinidad and Tobago. It may have relatively recently colonised the latter island. It is associated with open woodland and cultivation with large trees, but is also the only cowbird that is found in deep forest. It is a quiet bird, particularly for an icterid, but the male has an unpleasant screeched whistle, shweeaa-tpic-tpic. The call is a sharp chek-chik. 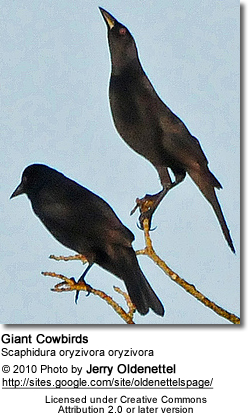 Like other cowbirds, it is a brood parasite, laying its eggs in the nests of oropendolas and caciques. The eggs are of two types, either whitish and unspotted, or pale blue or green with dark spots and blotches. The host’s eggs and chicks are not destroyed, but there is considerable doubt about the theory that the young Giant Cowbirds benefit the host’s chick by removing and eating parasitic flies. Their icterid hosts breed colonially, and defend their nests vigorously, so even a large, bold and aggressive species like the Giant Cowbird has to cover an extensive territory to find sufficient egg-laying opportunities. Several Giant Cowbird eggs may be laid in one host nest. 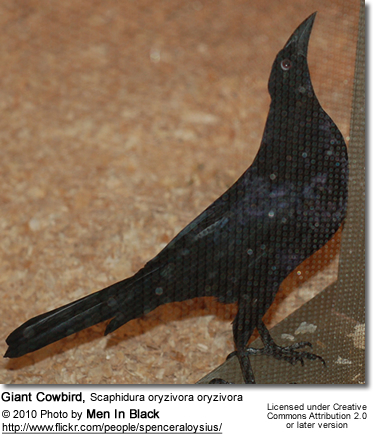 The male Giant Cowbird is 36 cm long, weighs 180 g and is iridescent black, with a long tail, long bill, small head, and a neck ruff which is expanded in display. The female is 28 cm long and weighs 135 g. She is less iridescent than the male, and the absence of the neck ruff makes her look less small-headed. Juvenile males are similar to the adult male, but browner, and with a pale, not black, bill. This gregarious bird feeds mainly on insects and some seeds, including rice, and forages on the ground or in trees. It rarely perches on cattle, unlike some of its relatives, but in Brazil it will ride on Capybaras as it removes horse flies.